Hey-o! Suddenly it’s nearly seven in the evening and I’ve yet to even think about a MoFo post. What does that mean? It’s survey time! Imma do one of the original MoFo surveys, because I filled out the 2010 version already. Almond! Generally Almond Breeze, but I’ll admit it – I like Silk’s version, too. I’m getting ready to dive into Viva Vegan! tomorrow, and I’m pretty excited. But I’m not going to share exactly what I’m planning to make, because that would ruin the surprise! I really freakin’ love kettle corn. Geeze… I don’t know. I tried making some apple bread from scratch once, and it was just weeeird. I hadn’t figured out the science of baked goods at that point. Uh. Cucumbers. I’m not really a fan of any other pickled things… it’s that whole aversion to vinegar, y’know? Well, there’s my infamous “Crap I Want to Make” Pages document, in which I store terribly-organized links to bloggy recipes. Then I tend to use tiny bits of paper as placeholders for recipes that catch my fancy while I’m reading through a cookbook, which inevitably means that my cookbooks have bits of paper between every page. Heh. How dare you. Umm. Dark chocolate… kale… peanut butter? I detest this question. Every Christmas morning we ate cinnamon buns and grapefruits. Still do, actually; last year my mommy made vegan cinnamon buns and they were out of this world. I’ve really only tried a few, but Coconut Bliss is the shizz. Oy. I don’t really have many fancy-pants appliances right now, sooo… my stove. Hahah. I have an American Girl cookbook back home somewhere. 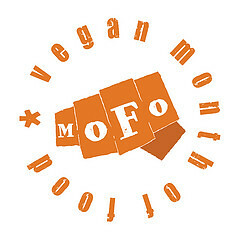 Hmm – when I go back to my parents’ house for Christmas, I should totally dig it out and veganize some of the recipes! Let’s be honest – any decadent baked good will do. I love baking. As for time of day, I like afternoon cookery, but I’m only home in the afternoon on weekends, alas. A glass serving plate, a giant tin of sesame sticks, a martini shaker, a ridiculous cow-udder shot glass, and vodka. A big ol’ bag of cherry tomatoes I froze during the summer, kale I also froze during the summer, and tons of frozen baked goods! I just went grocery shopping! Umm… still need some EB and vanilla, though. Woodman’s. I love its lack of fanciness and its surprisingly large stock of organic/natural/vegan-friendly foods. I want to work on some of the traditional Portuguese recipes my Grammy and Vava used to make when I was a kid. Oh pshaw. I love you all! Okay, I’m a boring purist type person – I really only indulge in dark chocolate! If we’re talking price, I bought a bottle of applejack brandy the other day. IT’S BEEN A ROUGH WEEK; DON’T JUDGE. …dude, I filled out this survey last year, too. Aaand most of my answers haven’t changed, although there’s 200% more alcohol in this post. SRSLY DON’T JUDGE. Yay; hooray; that was fun… but this post is lacking something visual that’s not too abysmal. 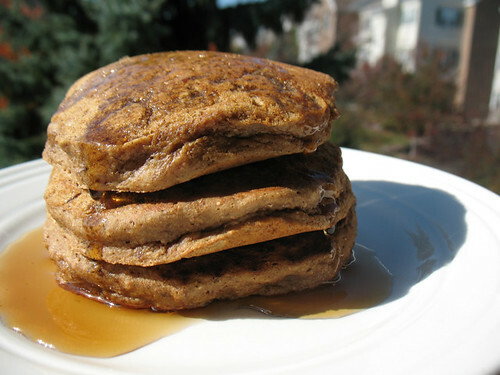 How about a stack of fluffy, whole wheat pancakes? I’ll post the recipe for these babies soon, but for now you can just look at them in all their fluffy, puffy glory. P.S. Lest you think it was sunny and warm today, it wasn’t. This is an old, previously-unseen photo. It was grey and rainy and cold… all the better to get a head start on my holiday knitting! Woohoo! How’s the weather where you live? What did you do today? Ah, your pancakes look great, not too abysmal at all…say, that reminds me, I think tonight I’ll take in an old Steve Reeves movie…I’ll be very interested to see your Portugese conversions! I like this survey and it was fun reading your answers. Ahhh, Kelly, I LOVE Woodman’s! I would go there with my grandparents when they were living in Madison. Awwww, I’m having Grandpop nostalgia. :) Thanks for posting this! :) Yay! Glad to be of service. I am a lover of kettle corn, too!